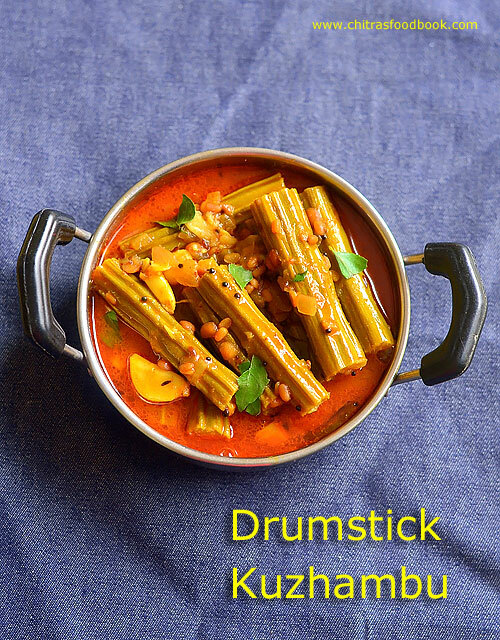 Today’s drumstick puli kuzhambu/ Murungakkai kulambu is my MIL’s Tamil style vatha kuzhambu recipe adding drumstick. I made slight variations from the authentic procedure and made in a pressure cooker directly. We call this as murungakkai vatha kuzhambu. Some people name it as drumstick kara kuzhambu too. 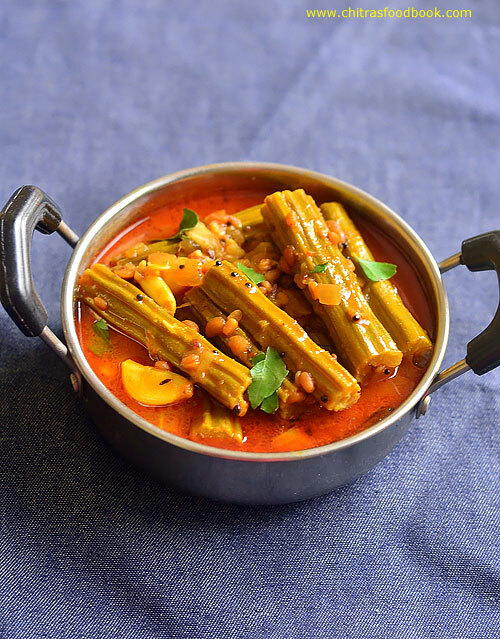 As this kuzhambu is without coconut, spices and masala, flavor of drumstick would be dominant. Sometimes my MIL adds brinjal and make it as kathirikai murungakkai puli kulambu. They both compliment well in taste and flavor. But I used only drumstick as Sendhil and Raksha are not fond of brinjal. Friends, If you are looking for some easy murungakkai vatha kuzhambu recipe with full flavor of drumstick, you must try this recipe. My mom also makes Tirunelveli style murungakkai puli kulambu but its with freshly ground spices. For this no grind recipe, sambar powder or vatha kuzhambu powder is the major ingredient. So anyone can make it quickly and easily. This kuzhambu recipe would be ideal for bachelors and working women to whip up a quick gravy for rice. So lets see how to make Tamil nadu style Murungakkai puli kuzhambu / Drumstick gravy for rice with step by step pictures. Do check out my yummy Murungakkai poricha kuzhambu recipe, Murungakkai masala/ Drumstick poriyal and Drumstick sambar too. Wash and chop drumstick into finger size pieces. Soak tamarind in 1 cup warm water and take the extract. In a pressure cooker base, temper & saute all the ingredients. Add drumstick and saute for a minute. Then add tamarind extract, sambar powder, turmeric powder, jaggery and salt. Mix rice flour in little water and add to kuzhambu. Pressure cook everything in high flame for 2 whistles. Remove after steam is released. Serve with plain rice adding few drops of sesame oil. Soak tamarind in 1 cup warm water for 10 minutes. Wash and chop drumstick into pointer finger size pieces. Slit slightly in one side. Chop 1 big onion or 5 small onions,5 garlic cloves and curry leaves finely. Peel 10 garlic cloves and keep it whole. In a pressure cooker base heat oil and splutter mustard seeds, methi seeds, urad dal, cumin seeds, toor dal. Add the finely chopped onion, garlic and curry leaves. Saute till onion turns transparent. Add drumstick pieces and saute for a minute. Add 1 cup of tamarind extract, sambar powder, turmeric powder, jaggery. Mix well and allow to boil in low flame. Dilute 1 tsp of rice flour in 2 tbsp water without lumps. Add to the boiling kuzhambu. Mix well and check for taste. Add more sambar powder & salt if needed. Open the cooker after the steam is released. Mix well and check for the consistency of kuzhambu. If its too watery, allow to boil for few minutes till thick. Switch off the flame and transfer the kuzhambu to a bowl. Add a tsp of sesame oil and few curry leaves. Close it with a lid. Let it rest for 30 minutes to one hour before serving. Mix with plain rice and enjoy with any kootu, papad ! Adjust the quantity of sambar powder as per your taste. You can also use vatha kuzhambu powder instead of sambar powder. If you do not have sambar powder or vatha kuzhambu powder, you can use 1 tsp of red chilli powder + 1.5 tsp of dhania powder. The quantity of spice powders may vary based on the tanginess of tamarind. So always check the taste and adjust them if needed. This kuzhambu will be slightly watery. But it tastes great when mixed with plain rice. 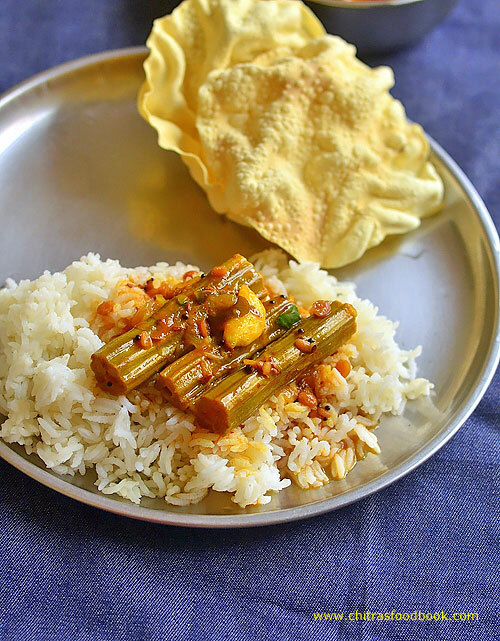 Try this easy Murungakkai kuzhambu using pressure cooker and enjoy ! Yummy curry, will try this.